The following story relates facts collected by The Caine Tool Collection Committee, past and present and collated by Rod Thomas, Chairman CTCC in 2001. Thomas Sydney Caine aged 66 - August 1961In the late 1960s Thomas Sydney Caine decided to leave all his worldly goods, in particular his extensive collection of tools, to the National Trust of Australia (Victoria), and thus established the Caine Tool Collection. Thomas Sydney Caine was an ordinary man, who began and ended his life in an ordinary house in North Melbourne. He trained and worked as a carpenter and joiner, and may have become a manager of a small joinery business or even operated as a builder in the latter part of his working life. He was born 6/11/1895 and died 17/09/1968, at the age of 73. He married in the 1930s, but his marriage didn't last long and ended in divorce. We believe that in his later years he became concerned at the realisation that the increasing use of power tools, and the increasing availability of mass produced manufactured goods was causing a steady decline in the use, availability, and understanding of the tools from which he, and his father, gained their livelihoods. He responded to this concern by developing a large collection of tools, starting with his own and his father's tools, and adding tools bought from other tradesmen as the opportunity arose. His final step was to leave all his tools to the National Trust. Also his house and investments together with all his other assets and accumulated /collected items, so that a fund could be established to ensure that the collection was preserved and displayed for the benefit of the people of Victoria. Thus the Caine Tool Collection Fund was established. It is interesting to note that during 1963 he had considered giving his collection to Science Museum of Victoria, prior to making arrangements with the National Trust. He was very anxious to help whoever was to follow him in handling his possessions. He wrote notes about everything which he felt needed identification or explanation. He prepared labels of white fabric and tied them to the objects of concern with builder's twine. He often wrote the same information on both sides of the label! Many of his tools had labels attached, and many of the items in his house were labelled. This is a Turkey Stone a Natural stone. Used extensively years ago in joiners shops. It is a slow cutting stone but puts on an excellent edge. This stone is unprocurable at the present day. For oil use only Neatsford Oil or Neatsford Compound Oil. Do not use thick oil as it clogs up the pores of the stone. 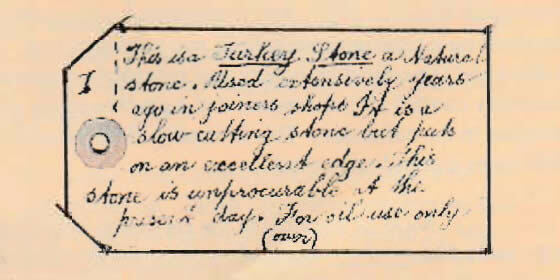 "This is a Turkey Stone a Natural stone. Used extensively years ago in joiners shops. It is a slow cutting stone but puts on an excellent edge. This stone is unprocurable at the present day. For oil use only Neatsford Oil or Neatsford Compound Oil. Do not use thick oil as it clogs up the pores of the stone." These Dies and Taps belong to stock number 25 The set where the dies are on an angle to the handles These are Whitworth. "These Dies and Taps belong to stock number 25 The set where the dies are on an angle to the handles These are Whitworth." The need to manage a collection of tools was a new experience for the Trust, and the skills needed were not readily available at the time, so the Collection was placed into storage while the Trust responded to the many other demands on its energies. In the early 1980s a group of tool enthusiasts formed the Hand Tool Preservation Association HTPA (later to become the Hand Tool Preservation Associationof Australia), and offered to assist the Trust in the work of managing the Collection. In 1983 the National Trust invited the HTPA to nominate four members to form a committee to manage the Collection and thus the Thomas Caine Tool Collection Committee was formed. This core committee, who are all members of the National Trust, is supported by an active group of volunteers, who attend working bees to identify, clean, and catalogue the tools, and to prepare them for display. The principal element in the management plan for the Collection is to catalogue every item, using the cataloguing system recommended by the Museum of Victoria. Each item is numbered and recorded in the Register, described on a catalogue worksheet, and photographed. This system has also evolved and the Collection is now also recorded on computer database which will eventually contain all information and a graphic image of the majority if not all the items in the Collection. This in itself will be a major project as there are over 1,500 items currently recorded. Most of the tools in the collection date from the early 19th century to the early 20th century, and so they show the development of tool design, and of trade skills, from the early period of white settlement in Victoria to the peak of hand tool design, quality and manufacture in the late 19th century and the early part of the 20th century. These tools also reflect the construction and finishing skills which created the buildings most impo1iant to the National Trust. Many of the tools in the collection are woodworking tools, drawn from the many disciplines of working wood. There are tools from other trades - wood and metal turning, boot making, plumbing, sheet metal working, slating, engineering, blacksmithing, picture framing, brick laying, concreting, plastering, painting and decorating, jewellers and clock making. There is a pedal woodworking lathe, two pedal metalworking lathes, an industrial sewing machine, a set of tinsmith’s rollers, pedal fretwork machines, a pedal operated polishing head, and a pedal operated circular saw. There is a magnificent workbench, in the European style, but much longer than is usual. The bench-top itself is made from a single piece of Oregon, 4 inches thick. There are two full sized traditional tool chests, and several smaller tool boxes. Unfortunately, the original contents of these tool boxes have been dispersed though Caine documented the content - click to see contents of Tool Box No. 1 and Tool Box No. 2. Obviously people found it necessary to remove the contents to make the boxes easier to move. The largest tool chest, which measures 38 by 27 by 26 inches, is heavy enough to move empty . It is hard to believe that men used to move it when it was full. Clock Maker's Lathe - design patented 1858There is a significant collection of clock maker's tools and accessories. There is a superb clock maker's lathe made of brass featuring a design patented 1858. There are many unrelated items, such as two bicycles, which the Caines would have used, and many bicycle parts and equipment for working on bikes. A number of tourist cuckoo clocks, assorted coffee pots, half a dozen kerosene cookers, items for which we have no explanation. Other interests were photography and fishing. There are several wood fishing reels in the collection. There are exotic items such as an epidiascope, a circa 1860 trumpeter clock, a sextant by Spencer Browning and Rust which is on display at Polly Woodside. Substantial items such as the cedar sideboard with its secret drawer currently in the members’ lounge at the Trust’s headquarters at Tasma Terrace, a cedar chest of drawers in our keeping, also two small Wellington-style chests of 8 and 9 drawers. There are three small 19th century steam engines, one being from the launch Valetta, which the family owned. The objectives of the Caine Tool Collection Committee are to preserve, catalogue and display the Collection. These objectives conform to the wishes expressed by Thomas Sydney Caine in his Bequest, and implied by his endeavours in his later life to build a comprehensive collection of tools. The Collection as it is now is extensive, but not complete. We believe that Caine's approach to building a tool collection was to buy tools in good condition whenever the opportunity arose. It had been the hope of the Committee prior to the Trusts' decision to class the Collection as closed to make the Collection as fully representative, as possible, of the many trade/craft groupings of tools held in the Collection. A number of purchases had been made to fill gaps, also a number of donations were accepted. A carriage builder’s kit of tools being worthy of inclusion in the Collection, yet other gifts of poor condition and really not of a suitable standard for inclusion. The only tools from the Collection on permanent display can be seen at the Polly Woodside - Melbourne Maritime Museum, although only a dozen or so, and they are not identified as being part of the Caine Collection. The three small steam engines are also kept at Polly Woodside, but the bulk of the Collection remains in storage. A large number of interesting tools are affixed into our display panel system ready for assembly at display venues. Some of the Collection can be seen at occasional temporary displays. The main outings are at Gulf Station, the National Trust's historic farm property near Yarra Glen, for Scottish Settlers Day and Classic Crafts Day, the Timber and Working with Wood Show, and the Doncaster Woodworking Festival weekend. Display capability improves steadily, but there are unlimited opportunities for further improvement and opportunities. The temporary displays, although well supported, do not really satisfy Thomas Caine's wish of displaying his tools for the people of Victoria. What is really needed is a suitable building in which a permanent display can be put together. The Trust has undertaken the massive task of cataloguing all their collections at all the properties. Several items relating to Caine have turned up and have been placed back in the Collection under our care. We may receive more pleasant surprises as time passes. Out of storage, a box of books and ephemera turned up during year 2000. A virtual treasure-trove, a box full of books, catalogues, writings, photographs and other items belonging to Thomas Sydney and Thomas William Caine, Sydney's father. A quick review turned up a lengthy essay by William, “Bicycle Tour through Victoria”, dated 1899 and some writings from the young Sydney, which included an essay on the 21 foot steam launch Valetta his father had purchased during 1897 and used at various times and places including the Gippsland Lakes during the late 1890s and early 1900s. ‘Valetta’ was named by its original owner after Valetta St, Malvern where he resided. The launch was lost in a flood on the Maribyrnong River in 1906. The engine was out of the launch at the time. The steam engine from this vessel is currently at Polly Woodside along with two other steam engines the Caines had acquired. Other maritime items currently in the collection may also be from the launch. Photos suggest that the family may have been involved with another boat, the ‘Seaspray’. Photos of groups of men, also negative plates are to hand. Unfortunately the photos are not identified as to who the people are or where the shots were taken. When the material from the box is fully processed and digested, we may turn up some previously unknown facts about Sydney and his father. Also, out of storage, a framed school photo with a note in Sydney’s hand writing on the back stating “This is Errol Street State School North Melbourne Victoria. ‘Thomas William Caine’ went to this School when a boy, he is in this picture. Standing up in about the middle”. The fact that Caine senior is in a State School photo tends to suggest that he came to Australia with his parents at an early age, possibly directly from the Isle of Man. One of Sydney's notes state this as his father's place of origin. Other items from another Trust property Mott's Cottage at Port Fairy, have found their way home, including a nice brass and leather bound telescope. Although many items have been retrieved from various people and other Trust properties and/or out of storage there are many gaps in the collection. There must be many items still at various properties that we are unaware of. Thomas Sydney Caine's WorkshopWe have copies of professionally taken photos of Sydney Caine at age 66, taken August 1961, a smiling and a more serious shot. Two aspects of his workshop, one clear and the other deteriorated. Also his Sloyd Certificate of Excellence, the original, No 614, from the Sloyd Centre North Melbourne dated the 8th March 1912. He was obviously skilled as he achieved a mark of 90% on the 33 models completed. For an interesting insight into the background of Sloyd training click here.) The Certificate has recently been reunited with the Collection. It was in 1912 that Sydney was apprenticed for six years to the joinery of timber merchants Andrew Kerr of Franklin St Melbourne. Other items of interest that did exist and hopefully will be located again and reunited with the collection at some stage are a passport, his indentures, the original photos of himself and his workshop. 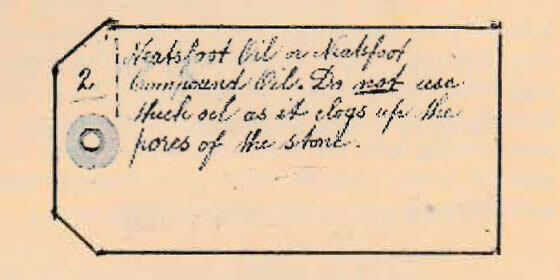 Thomas Sydney Caine's description of his MarkThe mark on the majority of the wood tools in the Collection is T. CAINE either by itself or in conjunction with one or more other owner’s marks. Several examples of his metal mark exist. 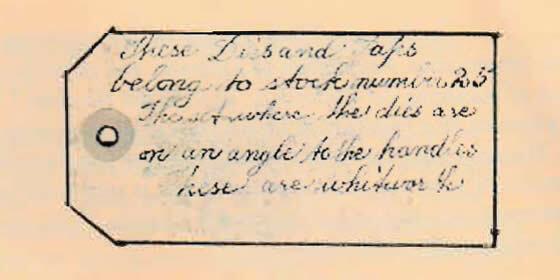 It is reasonable to assume that the stamp T. CAINE may well have been his father's and that the majority of the wood planes were also William's. We can assume the stamp continued in use on tools Sydney acquired. There are several different names on wooden moulding planes and bench planes and the like. Two names feature extensively, generally in conjunction with the Caine mark . An interesting point is although he is now generally referred to as Thomas Caine it would appear he preferred to use Sydney Caine, at least during certain periods of his life. On his 1912 Sloyd Certificate, the young man went by Sydney. Letters signed during the latter part of his life are signed S. Caine. Legal documents at this time were signed Thomas Sydney Caine. An interview (by then HTPA member Nigel Lampert during 1991) with a Jack O'Mara, Union organiser, who came into contact with Caine during the 1947 - 1950 period suggests he may have answered to Tom at that time. O'Mara described Caine as about 5'8", stocky, with brown hair and he wore glasses. Caine was also described, “He was not given to oratory”. A neighbour at the Molesworth Street house, Eileen Chandler, in an interview for a 1985 Age article about Caine and his Collection, described him as a tall, thin man who always wore a hat. She commented, "He didn't talk to a lot of people". At least one thing didn't change over the years. The house in Molesworth Street North Melbourne is a single storey double-fronted solid brick house with slate roof containing six rooms plus workshop with loft, (possibly originally stables) built by Thomas William Caine in 1865. We understand that William occupied the house up to 1922, and assume that Sydney was there till this date also and that Thomas Sydney Caine moved back there in 1964, and lived there, alone, until he died in 1968. He was interned at Melbourne General Cemetery along with his family per his request. Funeral directors, Mulqueen and Sons Pty Ltd of 170 Sydney Road Brunswick were arranged in advance. In his manner of having everything organised and prepared, his name was already on the headstone, all that was needed was the date. The man was born and died in the same house and yet most of his 73 years remain a mystery. For someone who made such a significant donation to the people of Victoria it is most unfortunate that so little is known about him.